This summer I got the chance to grab lunch with Janna Morishima, half of the husband-and-wife team behind Kyo Morishima Photography. Janna and Kyo are longtime APW photographers—at lunch Janna and I did the math and realized the first time we met was four years and one baby ago (hers, not mine, ha). One reason I think y’all keep gravitating toward them is that their personalities are as warm and low key as Kyo’s candids are artfully emotional. Also, they are hella affordable, with rates starting at just $3,200 for a full eight hours of photography, which guys, in the New York City tri-state area is 🤯. But another major reason seems to be, well, food. Food was important at our own wedding! We got married at city hall and then had a very casual wedding party near where I grew up. One thing we did was get red lacquer chopsticks and wabi sabi–style sake cups for each one of our guests at Korin, the superb Japanese restaurant supply shop in Tribeca. I also ordered custom mini bundt cakes from my friend Warren Brown of Cake Love, who used to have a bakery in D.C., but is now a cookbook author. We have never met foodie people that we didn’t like. I think the type of people who love food tend to be adventurous, enjoy traveling, and have an open mind and a taste for new things. Those are exactly the kind of people we like to hang out with. We also love giving recommendations to people, and getting recommendations back. Usually, when we find out that someone loves craft beer, Kyo immediately wants to know where they go to fill their growler, and which are their favorite brews. Or if I find out someone loves to bake, I want to know which cookbooks they love and whether they’ve tried any especially good recipes lately. And of course we love to give recommendations specific to weddings. It’s so much fun to share the love and tell people about the super talented caterers, cake bakers, restaurants, food trucks, etc., that we’ve worked with. Michelle and Rex are a super fun-loving, stylish, adventurous couple who met and live in Manhattan. They celebrated their wedding at the Metropolitan Building, a unique venue in Long Island City that was originally a car parts factory built in 1909, and is now a dramatic, wide-open space for events and photo shoots. Since Michelle and Rex celebrated their wedding in Queens, they wanted to have a little “piece of Manhattan” at their reception. They did that by hiring Michelle’s favorite food truck, the iconic yellow Wafels & Dinges truck, to park outside the venue and serve delicious Belgian waffles with piles of whipped cream and chocolate syrup all night long. Needless to say, the waffle truck was a huge hit (especially with the kids who were at the party—they were in seventh heaven!!!). Since food trucks have become so popular in recent years, these days, you can find a food truck for almost any cuisine or specialty. It’s a great way to treat your guests to your very favorite food! Simone and Adam are self-avowed “major league foodies” who were adamant about having delicious food at their wedding… They were getting married at The Green Building, a raw space venue in the Gowanus neighborhood in Brooklyn. The Green Building does not cater events themselves, so Simone and Adam had to find their own caterer. And they wanted to find someone who’d serve the kind of food their guests would remember years and years later. We both love food and being able to serve a great meal to our guests was important to us. We did a lot of online research and made a list of caterers who were in our budget and looked like good candidates. The first caterer we talked to was Chef Aaron from The Night Kitchen. He actually came to our apartment and cooked a tasting for us and some friends in our home. Everything was outstanding. One of Adam’s favorites was the octopus—we were absolutely blown away by it. Chef Aaron was fun, calm, and easy to get along with; we liked him so much that we didn’t even consider the other caterers. Deciding on the final menu was difficult. We were having a hard time narrowing down dishes to include on our menu, so we met with Chef Aaron at a bar during the summer and talked over the options. He sent us a proposed menu a few weeks later and we loved it. We had lots of fall-themed veggie dishes including an incredible squash dish with pomegranate. We decided to serve the food family-style, and we’re so glad we did it that way because it fostered such a feeling of togetherness among our guests. As part of the catering decision, we decided to not have a wedding cake. We both have some historical desserts in our families, and we felt that honoring those traditions would be more fun that having a cake. Adam’s mom made pies and Simone’s mom made cowboy cookies. Another inspiring thing about Simone and Adam’s wedding is that they did all the decor themselves. They went to the Flower District in Manhattan, bought a bunch of greenery, and simply decorated the tables with greens and loads of sparkling tea lights. You can see from the pictures how stunning it looked! Alex and Ethan are another food-loving Brooklyn couple. But they wanted to get married in the countryside, at a farm where the food would be as local as possible. They found an utterly charming spot at Blooming Hill Farm in New York’s Hudson Valley. Guy Jones started Blooming Hill Farm in the 1980s, growing an eclectic assortment of organic vegetables before organic was such a big “thing.” He was particularly interested in growing unusual varieties, and his produce attracted the attention of big name chefs in New York City. Soon, Blooming Hill Farm was supplying heirloom vegetables to some of the best restaurants in the city. To this day, Blooming Hill Farm supplies vegetables to iconic restaurants like Babbo, Momofuku Ssam Bar, Morimoto, Po, Prune, and the Union Square Cafe. But they’ve also developed a new business as a wedding venue, catering events with fruits, veggies, and foraged ingredients from their own farm. Alex and Ethan’s wedding menu included brick oven pizza with shaved squash, zucchini blossoms, orange mint, homemade ricotta, and heirloom tomato confit. Yum! Interesting side note about Alex and Ethan’s wedding: it poured rain all day and night. Naturally this was disappointing to Alex and Ethan, who were looking forward to their guests enjoying the gorgeous landscape and farmlands. But in the end, they A) didn’t let the rain stop them from having a FABULOUS TIME, and B) let Kyo take outdoor portraits of them, even though it was raining cats and dogs! And you can see that the rainy weather made for some incredibly atmospheric photographs. So there’s a silver lining to every cloud. Wedding cakes tend to be pretty and sweet. But what if you were determined to go beyond “pretty and sweet” to something drop-dead gorgeous and utterly delectable? That’s exactly what Jennifer and Michael served at their raucous and glamorous wedding reception at the Lotos Club off 5th Avenue near Central Park. Their wedding cake was the most stunning and intricate baroque masterpiece we have ever seen—and it tasted incredible, too! Although the cake was insane, it wasn’t the only memorable thing at Jennifer and Michael’s wedding. It was obvious that they LOVE treating people well, and they know how to throw a party. They served towering trays of lobsters, oysters, and other fresh seafood; exquisite canapés; fine wines; and caviar. At the after-party in the Lotos Club’s basement Grill Room, there were silver platters stacked with milk and cookies in addition to monogrammed macarons. The food and drink at their party was ridiculously awesome, but the music might have been even better. Michael grew up in Harlem with a mother who founded Harlem’s National Black Theatre. His whole family is deeply connected to Harlem’s music scene, so most of the musicians who played at his wedding (many of whom are associated with the Harlem Arts Festival) were either friends or family. The dancing and revelries lasted way, way into the night. Nadira and Dave are another couple with deep roots in their neighborhood, who seem to know everyone. They met in Crown Heights, live in Crown Heights, got married at their favorite tattoo parlor in Crown Heights, and celebrated their reception at their favorite restaurant in Crown Heights: Aita Trattoria. Aita Trattoria is a lovely little Italian spot that, according to various food reviewers, “serves life-changing lasagna” and is the “ultimate neighborhood restaurant.” (That last quote is from the New Yorker.) It’s known for fresh pasta, homemade bread, and traditional antipasti like fried artichokes and Sicilian rice balls. The nice thing about getting married in a place that you visit on a regular basis is that it feels so homey. There was nothing about Nadira and Dave’s wedding that felt formal or stuffy—it felt like you were hanging out in someone’s home at a particularly fun party with great food. The ambience was mellow but joyous at the same time. Since Nadira and Dave had such a great relationship with the restaurant’s chef and owner, there were lots of nice touches during the reception. Our favorite was the custom message to them on the restaurant’s chalkboard. And since this is a post about food, it’s definitely worth mentioning their wedding cake: it was GORGEOUS. Crafted by the incredible Lael Cakes studio, it was festooned with gold leaf and flowers. Not only that—it was gluten-free, dairy-free, and vegan! So if you’re looking for a photographer who will be 1,000 percent on board with your food-focused wedding (and snap great shots or you AND the food)—check out Kyo Morishima Photography today. Kyo’s rates start at just $3,200, which is bananas (food pun not intended), considering Kyo’s fine art photography background (including a B.F.A. in Photography from the Corcoran School of Art and work as an assistant for photographic legends such as Mary Ellen Mark and Deborah Turbeville), and eighteen years of experience shooting weddings. You can learn more about Kyo and Janna, see their most recent work, get some of their best wedding tips, and contact them with questions or book them here. 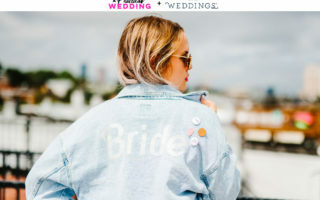 CLICK HERE FOR 101 CREATIVE WEDDING IDEAS—MORE REAL-LIFE INSPIRATION STRAIGHT FROM KYO AND JANNA’S COOLEST COUPLES TO YOU!